Dealing with refugee flows in Austria – a crisis of policy? The last months were characterized by a large influx of refugees from the Middle East to Europe. Most of the refugees arriving in European countries stem from Syria, Afghanistan and Iraq. The number of first time asylum seekers in the second quarter of 2015 compared to the same quarter in 2014 increased by 85% (EUROSTAT: Quarterly report September 2015). While refugees were leaving everything behind and risking their lives in hope of escaping from war and political instability, the European Union in general and Austria in particular were extremely overburdened with dealing with a constantly growing number of incoming refugees. Although the importance of finding a common EU strategy and developing a fair Burden-Sharing became more and more evident, a consensus between the EU Member States could not be reached. The EU’s policy to deal with the refugee crisis has completely failed. Not only did the EU’s policy fail, but also the Austrian government was not able to deal with the crisis. Austria received thousands of refugees per day, most of them wanting to continue their journey to Germany, Sweden or to another European country. For those who have chosen to apply for asylum in Austria no appropriate support has been offered, forcing thousands of refugees to sleep in the streets or tents. In order to prevent an intensification of the humanitarian crisis, the Austrian civil society played a central role in providing support for the exhausted refugees. Civil society organizations such as the Austrian Red Cross and especially large numbers of volunteers have provided food, clothes as well as first aid. Moreover, besides assistance in regard to basic needs, they have given a feeling of being welcome. Thousands of volunteers have worked at the borders in “Nickelsdorf” and “Spielfeld”, and at the “Westbahnhof” and “Hauptbahnhof” in Vienna as well as at the train station in Salzburg and at various reception centers. Without their work, the so called “refugee crisis” would have turned into a “humanitarian crisis” of a much larger scale. This paper deals with Europe’s response to the current refugee crisis in general, and with Austria’s policy towards the refugee issue in particular. Its main focus lies on the role of civil society and the inabilities of the state agencies to deal with this humanitarian crisis. It does so by analyzing the situation in the Traiskirchen refugee camp and the fight between local governments and the federal government in regard to the distribution of refugees in the country. Both examples serve as examples for the state’s failed refugee policy. 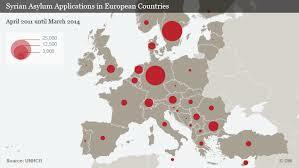 The paper first gives an overview of refugee flows in Europe. In a second stage the article sets the current refugee crisis into context with the broader debates on the integration of migrants. In a last step the engagement of the civil society is analyzed. According to EUROSTAT the three largest asylum seeker communities in the EU came from Syria, Iraq and Albania (EUROSTAT: Quarterly report September 2015). In the second quarter of 2015 most Syrian refugees were registered in Germany, followed by Hungary, Austria and Sweden. As for the Afghanis about half per cent were seeking asylum protection in Hungary, and about 90% of the Albanians applied for asylum in Germany. In ten EU-Member States Syrians made up the main citizenship of asylum applicants. (EUROSTAT: Quarterly report September 2015). Concerning Austria in the second quarter of 2015 the third largest absolute increase of asylum application in the EU was recorded. (EUROSTAT: Quarterly report September 2015). In the period January until September 2015 Austria’s asylum seekers were mainly from Syria, Afghanistan and Iraq. (BMI: Vorläufige Asylstatistik September 2015). As referred above Austria’s asylum seekers mostly have their origin in the Middle East. The Middle East is currently experiencing a dark period characterized by conflicts, unstable regimes and economic downturn. An ending of Syria’s four year lasting internal conflict is currently not in sight, while military confrontation is continuing. Syrian refugees make up about 4 million people, most of them living in Turkey, in Lebanon, in Jordan, in Iraq, in Egypt as well as in other Northern African States. (UNHCR: Press Release: 09/07/2015). The limited livelihood opportunities lead to a feeling of insecurity and loss of future perspectives. Many suffer from high costs of living and restricted access to legal employment. In many cases savings are already spent and refugees have difficulties in covering their basic needs. Due to the lack of access to legal work, they are forced to resort to informal employment risking exploitation or they have to work in unsafe conditions. In Jordan for example working illegally can lead to be returned to a camp. In Lebanon, refugees have to sign and declare not to work when renewing their residency status. Aid programmes face chronic financial cut-backs. The food aid cuts, which affect thousands of refugees, are a central reason for leaving the country. Difficult conditions in refugee camps force Syrians to beg and to make use of child labor and marriages in a young age. (UNHCR: EuropePress briefing by Adrian Edwards: 2015). The lack of access to healthcare and limited opportunities of education further intensify the situation. Migration is considered “as the key to their physical safety”. (UNHCR: EuropePress briefing by Adrian Edwards: 2015). Iraq and Afghanistan are still characterized by political instability leaving the population without any future perspectives. Due to limited alternative possibilities to reach the EU, refugees are pushed into illegality and forced to turn to smugglers. The end of Dublin regulations? According to the Dublin regulations the state where a refugee enters EU territory first is responsible for the asylum procedure. The consequence is that the EU external border countries are overwhelmed with large numbers of refugees. They are not able to offer full services to refugees, can’t fulfill their duty in asylum procedures and don’t feel responsible to handle the refugee problem alone. In the case of Greece for example, the European Court of Justice of the EU and the European Court of Human Rights declared that conditions for refugees are inhuman and therefore Dublin regulations are not to be implemented there. (Guild et al: 2015. p. 4). In fact the distribution of asylum seekers across the EU is very uneven. Especially this crisis showed that the EU is in a need of a new system with far reception quotas for asylum seekers. The Dublin system has to be reconsidered. It is necessary to ensure that obligations for the reception of refugees are fulfilled. The EU Member States have to agree on a fair distribution key. Therefore new measures by the EU are necessary. (Guild et. Al: 2015). It is important to find a common European response to meet the EU’s collective obligations in international law, according to the EU legal order, the EU Charter of Fundamental Rights as well as the EU Treaties and legislation. European interior ministers met on September the 14th 2015 to discuss the refugee crisis and to find ways out. But it remains a challenge to reach a common strategy – the suggestion to relocate 120 000 asylum-seekers from Greece, Hungary, and Italy to other Member States under a quota system was not approved. Slovakia, Czech Republic, Poland as well as Hungary belong to the most skeptical EU-Member States in terms of a quota system. (Guild et al: 2015). How to integrate these people into society was long time not dealt with. Only within the last recent years, integration has become a priority for the Austrian government. It was firstly institutionalized by the creation of the State Secretariat for Integration within the Ministry of Interior in 2011, and became in 2014 a part of the Austrian Foreign Ministry, headed by the Federal Foreign and Integration Minister, Sebastian Kurz. In fact immigrant integration belongs to one of the most controversial topics in Austria. It is mainly focusing on language acquisition and civic education, as well as the sharing of values and norms. (Mourão Permoser / Rosenberger: 2012. p. 40/41) Due to ethnic differences and socio-economic marginalization of migrants “anti-foreigner sentiments among the population reinforced and contributed to the perception that there was an integration problem.” (Mourão Permoser / Rosenberger: 2012. p. 46). Politically this also led to the rise of right parties, which were successful in promoting xenophobia among the population. In the 1990s therefore a negative shift in the political perception of asylum was recorded. It was claimed that Austria has reached its receiving capacities. Asylum seekers were associated with criminality and the exploitation of the welfare state. At this time also the terms “bogus asylum seeker” as well as “economic refugee” occurred. (Mourão Permoser / Rosenberger: 2012. p. 46). Integration was often used in order to justify restrictive legislation by arguing that migrants and asylum seekers are not enough integrated. The Slogan “Integration vor Neuzuzug” (Integration before new immigration) of the coalition government between the far-right wing party FPÖ and the centre-right party ÖVP made the negative discourse evident. (Mourão Permoser / Rosenberger: 2012. p. 46). A lack of integration has been often connected with religion, in particular with Islam. Muslims are often “targeted by a rhetoric stressing that they will not comply with the Austrian value system.” (Mourão Permoser / Rosenberger: 2012. p. 46). A very similar discourse is taking place in connection with Europe’s current refugee crisis. Right wing parties highlight the fact that refugees are mainly arriving from Middle Eastern countries and have different traditions, religion and values. According to right wing parties they would be difficult to integrate. The Hungarian Prime Minister Viktor Orban for example decided to close the Hungarian borders to Serbia and Croatia in order to reduce the number of refugees entering Hungary. (Tirone / Petrakis: 2015) Concerns that refugees would bring in diseases, crime and terrorism are constantly increasing and lead to violent acts against migrants and refugees in various countries. Although, in Austria violent attacks on refugees have not been recorded so far, the rhetoric of “activists”, anti-immigration initiatives and local platforms as well as the discourse of right-wing parties is getting more and more xenophobic and islamophobic. At the same time, debates on the motivations of refugees have gained ground. Such discourses divide refugees into humanitarian ones who have fled war and violence and economic ones who are “just” seeking better living conditions. Austrian’s Integration Minister Kurz highlights that the European Union is in need of securing the EU’s external borders. He also distinguishes between “humanitarian” and “economic refugee” arguing that “economic refugees”, cannot be accepted. On the 19th of November he presented a plan with 50 priorities for integrating persons granted asylum. The central elements are language acquisition, entry to the labor market as well as the determination of values. (Austrian Integration Fund). This is being to be achieved by obligatory workshops dealing with European values. (Die Presse: 4 November 2015). While the political rhetoric has focused on the “otherness” of refuges and the problems they might cause for security and the labor market or on how to secure and control borders, the state has largely failed to provide humanitarian assistance. This has been particularly evident in the Traiskirchen refugee center. The camp outside Vienna is run by the private Swiss firm ORS. In 1956, Traiskirchen served as a place of humanitarian services to welcome refugees from the Hungarian Revolution. It is now the biggest refugee camp in the country. It made headlines in media because of the poor care offered for refugees and the inhuman accommodation and sanitary conditions. In the summer of 2015 at the height of the crisis, refugees were forced to sleep under the sky or in tents that were neither rain nor wind proof. According to a report of Amnesty International, asylum seekers were facing insufficient medical care, as well as unhygienic conditions in an overcrowded camp. Many complained about no access to sanitary facilities and the lack of security within the camp. In light of the state’s failure to provide basic needs, individual volunteers and civil society organizations have stepped in. (Al-Jazeera: 2015, Amnesty International: 2015). Traiskirchen represents just one among many other examples of reception centres where state authorities failed to provide adequate care and assistance. In addition to the situation, the distribution of asylum seekers within the country hardly functioned. The federal states have failed to take in their allotted quota of asylum seekers. Vienna represented the only federal state that accepted more asylum seekers than its national quota requires. (Der Standard: 2015) A constitutional amendment that gives the federal government the right to create accommodation centres for asylum seekers without the permission of states and municipalities, is with no doubt a positive development in regard to the accommodation of asylum seekers. However, it does not necessarily placate the heated public discourse on their integration. Undoubtedly, the Austrian government was absolutely overwhelmed with the huge migrant flows. Thousands of refugees entered the country but wanted to continue travelling to Germany, Sweden or to another destination. This caused an extreme overstraining at the Austrian-Hungarian borders in “Nickelsdorf” as well as at the Austrian-Slovenian borders in “Spielfeld.” While state authorities seemed to be in a state of shock and hardly able to react to the humanitarian dimension of the crisis, civil society played a central rule and and responded immediately to the need of assistance for refugees. Volunteers, civil society organisations, the Austrian Federal Railways, supported police and the Austrian Armed Forces in their work at the Austrian borders. They have been an indispensable part of the humanitarian work made at the borders. Refugees could pass the borders freely and were brought by buses to the train stations “Westbahnhof” and “Hauptbahnhof” in Vienna. Refugees with enough money went by taxis. (UNHCR: 25 September 2015). The assistance was mainly managed by the Austrian Red Cross. At the train stations volunteers offered food, hygienic articles and clothes. While at Westbahnhof the Austrian Red Cross took the organisation and coordination, at Hauptbahnhof a platform named “Train of hope” emerged. It was an ad-hoc creation of volunteers. Its aim is to offer supply (food, material donations) as well as information about the onward journey. Volunteers and translators are recruited through social media. Train of hope considers providing help as its obligation, especially because the European governments failed in handling the situation. (Train of hope). Due to its efforts “Train of Hope” was nominated by the Austrian League for Human Rights for the Human Rights Price 2015. (Österreichische Liga für Menschenrechte). These are not the only positive examples of civil society humanitarian assistance. There are many initiatives taking place, one of them is “Flüchtlinge Willkommen (Refugees Welcome)”, which is an initiative inviting asylum seekers and refugees to stay in people’s spare rooms instead of in mass accommodation centres. (French: 2015). “Refugess Welcome” also organized a concert where more than 150.00 people participated in order to show their solidarity with refugees. Other initiatives include leisure activities together with refugees or free language course provided by volunteers. The EU in general and Austria in particular are facing big challenges as regards to the current refugee flows. In the short and middle term view, solutions for the political instability in the Middle East are not in sight. The agreement of the 29th of November 2015 on migration between the EU and Turkey aims at gaining a win-win situation: Turkey would take steps to reduce the migration flows to Europe, while the EU facilitates the entering of Turkish citizens in the EU and provides more financial aid for refugees in Turkey. However, these agreed measures would not really reduce the humanitarian crisis taking place; they would only delocalize it outside Europe. The international community has to react on the current developments by firstly finding diplomatic solutions for the crisis and the unrest in the Middle East and secondly by integrating the refugees who have already entered Europe. The EU Member States have to find a common strategy regarding the distribution of refugees. They cannot escape any longer from their responsibility to react to the current migrant flows. It became evident that the Dublin regulations are no longer realizable. Providing possibilities to apply for asylum in the origin countries would enable safe journeys to Europe and prevent refugees from risking their lives. This would also be an effective measure against smugglers. Austria as well has to deal with its asylum seekers by providing them with the necessary care. The quick and professional engagement of civil society organizations and volunteers prevented a humanitarian crisis in Austria. However, in a long term view the assistance by volunteers is likely to decrease. The government has to act, and to provide better conditions in reception centers. Traiskirchen was and still is an example for a problematic refugee policy. Austria’s federal states have to meet their obligations in terms of fulfilling the refugee-reception quotas and the federal government has to insist on that. One of Austria’s biggest challenges will be to fight xenophobia. At the latest after the attacks in Paris 2015, where two refugees were accused to be involved, fear towards refugees has increased. However, statistics show that criminality by refugees in 2014 only made out 2% of the total criminality in Austria. (News: 2015). Thus, many fears are groundless. This has to be stronger communicated. As described above, there are also many positive examples concerning interaction between the local population and refugees. Although the planned “values workshops” for asylum seekers by the Foreign and Integration Minister Kurz are questionable, the 50-points plan to integrate persons granted asylum and the focus on language and labor are good steps forward. Al-Jazeera: “In Austria, refugees voice frustration at overcrowded camps.” 18 September 2015. http://america.aljazeera.com/watch/shows/america tonight/articles/2015/9/18/austria-syria-refugees-frustration-overcrowded-camps.html. 30/11/2015. Amnesty International: „Quo Vadis Austria: Die Situation in Traiskirchen darf nicht die Zukunft der Flüchtlingsbetreuung in Österreich werden.“ 14.08.2015. Angenendt, Steffen / Engler, Marcus / Schneider, Jan: “European Refugee Policy. Pathways to Fairer Burden-Sharing.” SWP Comments 2013/C 36. November 2013. Angenendt, Steffen: Refugees: The EU needs fair refugee reception quotas, German expert says. Interview by Dagmar Breitenbach, in: Deutsche Welle. 15.04.2015. Austrian Integration Fund: „Neu: 50 Punkte-Plan zur Integration vorgestellt.“ http://www.integrationsfonds.at/news/detail/article/neu-50-punkte-plan-zur-integration-vorgestellt/. 30/11/2015. Bundesministerium für Inneres (BMI): „Vorläufige Asylstatistik September 2015.“ 2015. Der Standard: „Flüchtlingsquartiere: Bessere Länderquoten dank Neuberechnung.“ 7 October 2015. http://derstandard.at/2000023094211/Fluechtlingsquartiere-Bessere-Laenderquoten-dank-Neuberechnung. 30/11/2015. Die Presse: „Flüchtlinge: Kurz will verpflichtende Werteschulung“. 4 November 2015. http://diepresse.com/home/politik/innenpolitik/4859251/Fluchtlinge_Kurz-will-verpflichtende-Werteschulung. 30/11/2015. EUROSTAT: Quarterly report September 2015: http://ec.europa.eu/eurostat/statistics-explained/index.php/Asylum_quarterly_report. French, Maddy: “Why Austrians are opening their homes to refugees.” Al Jazeera. 19 July 2015. http://www.aljazeera.com/indepth/features/2015/07/austrians-opening-homes-refugees-150714140340807.html. 30/11/2015. Guild, Elspeth / Costello, Cathryn / Garlick, Madeline / Moreno-Lax, Violeta: “The 2015 Refugee Crisis in the European Union: 2015” CEPS Policy Brief. No. 332, September 2015. Meyer, Sarah / Rosenberger, Sieglinde (2015): Just a Shadow? The Role of Radical Right Parties in the Politicization of Immigration, 1995 – 2009, in: Politics and Governance , Vol. 3, No 2 (2015), p. 1 – 17. Mourão Permoser, Julia / Rosenberger, Sieglinde (2012). “Integration Policy in Austria.” In: International Approaches to Integration and Inclusion. J. Frideres and J. Biles (eds.). Montreal/Kingston, McGill-Queens University Press. News: „Nicht Kriminalität von sondern gegen Flüchtlinge steigt“. 27 November 2015 http://www.news.at/a/fluechtlinge-kriminalitaet-oesterreich. 30/11/2015. Österreichische Liga für Menschenrechte: http://www.liga.or.at/2015/11/26/menschenrechtspreis-2015/. 30/11/2015. Tirone, Jonathan and Petrakis, Maria: Europe’s Refugee Crisis. 19 November 2015. http://www.bloombergview.com/quicktake/europe-refugees. 30/11/2015. Train of hope: http://www.trainofhope.at/home/wer-wir-sind/). 30/11/2015. UNHCR: “Women and children trek exhaustedly into Austrian town of Nickelsdorf to warm welcome” News Stories, 25 September 2015. http://www.unhcr.org/560573886.html). 30/11/2015. UNHCR: Facilitators and Barriers: Refugee Integration in Austria. October 2013. https://fluechtlingsdienst.diakonie.at/sites/default/files/unhcr-rice-austria-en_web.pdf. UNHCR: Seven factors behind movement of Syrian refugees to EuropePress briefing, on 25 September 2015, by UNHCR spokesperson Adrian Edwards. http://www.unhcr.org/560523f26.html). 30/11/2015. UNHCR: Total number of Syrian refugees exceeds four million for first time. Press Releases, 9 July 2015. http://www.unhcr.org/559d67d46.html. 30/11/2015. Welz, Judith / Winkler, Jakob (2014): “Abschiebepolitik im Spannungsfeld des liberal-demokratischen Paradoxons: Ermessensspielräume in asylrechtlichen Ausweisungsentscheidungen” In: ÖZP 2/2014. Wimmen, Heiko: “Sleepwalking in Brussels”. In: Centre for Southeast European Studies, University of Graz – Balkans in Europe Policy Blog, 29.10.2015.